Pack your beach gear, ready for beach bliss in the Gulf of Thailand. 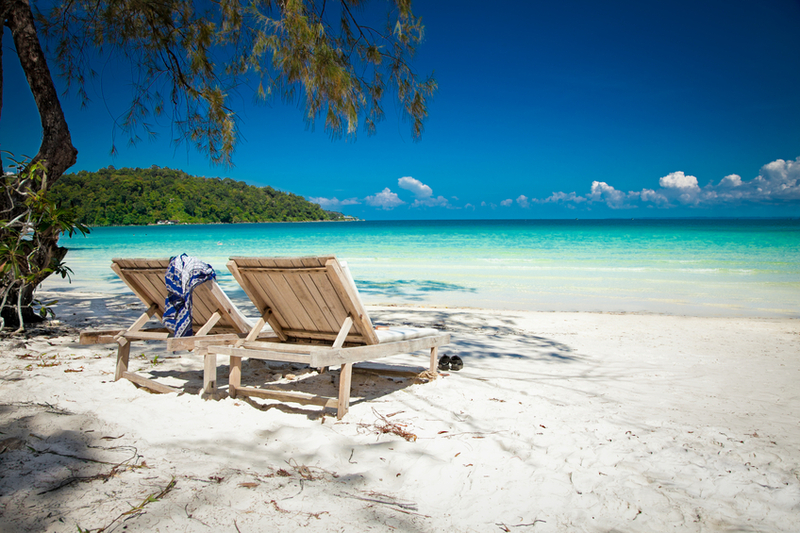 Just off Cambodia’s south coast, Koh Rong Island boasts 43 kilometres of sandy shores. There’s plenty of opportunity to stay at a dream beachside guesthouse, perfect for relaxing in a hammock by day and partying by night in lively resorts like Tui Beach. The aptly named Long Beach is a highlight of the island and enables you to live your dreams of meandering along sandy shores, stopping off for a dip in crystalline waters along the way – you can keep going for a good 7 kilometres here on the island’s western shore. Long Beach is also popular for simply sunbathing while the more energetic also prefer to fish or go snorkelling and diving. For a magical night experience, swim from the shore or take a boat trip to float amid the tiny, star-like phosphorescent plankton which shine from the ocean every single night. Because Koh Rong still has minimal development and light pollution, conditions are ideal for spying them. The plankton react to movement, lighting up when you swirl the water with your hands or feet – an exquisite and memorable experience. Perhaps you could leave your sunbed for the day and let out your inner monkey, swinging from the treetops just like our long-distant relatives did. The best views of the island can be had from the top of the trees, where you’ll spy the island’s stunning wildlife, flora and fauna. High Point Rope Park is a world-class rope adventure park which encompasses 21 carefully chosen trees with 25 platforms reaching twenty five metres high. You can traverse these via a web of cables, zip wires and ladders for 400 metres without so much as touching the ground – this should take an average of one hour but maybe you can do it faster! A great way to cool off and enjoy a little adventure is to grab a snorkel and mask and take to the blissful waters of Koh Rong. Dedicated snorkellers spy sergeant fish, parrotfish, sea horses, jumping fish, squid, diamond fish, diamond fish, needlefish, yellow boxfish, goatfish and blue-spotted ribbon tail rays. Scuba diving off Koh Rong is not to be missed with its warm, pristine waters, rich with sea life. There are around 15 different dive sites, including shallow reefs where you can admire one of the largest varieties of fish species anywhere in the Gulf of Thailand. Most dive operators prefer to take to the waters off Koh Rong Sanloem or islands further afield, like Koh Tang or Koh Prins, where the water is at its cleanest and clearest. Whether it’s PADI certification or a light trial dive you are after, there’s no better place to learn, while marvelling at the beauty Koh Rong’s coral reefs. Bear in mind that in low season, the waves are a little choppy, mixing up the sand and visibility is reduced to about one metre or less. 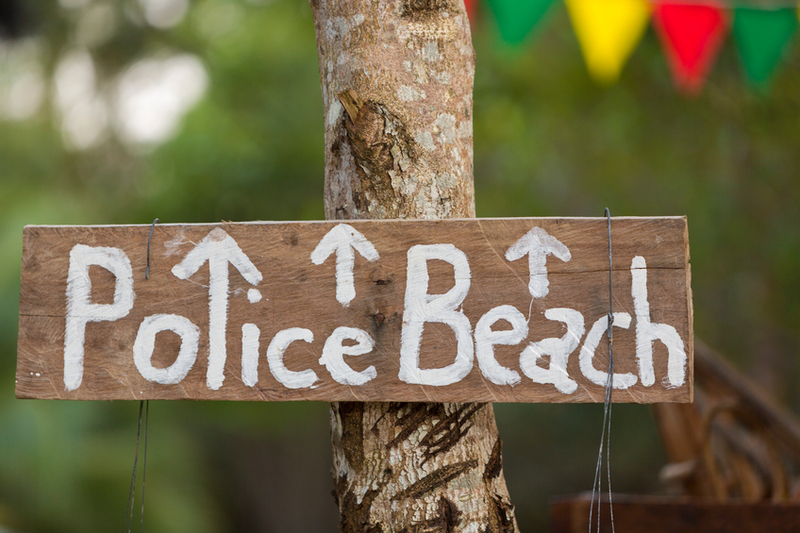 Wednesdays and Saturdays are when all-night parties take place on Police Beach which includes a fully-stocked bar and a soundtrack of deep house, techno, drum and bass. The party lasts as long as you do. The ever-popular full-moon parties also take place on Police Beach and normally keep rocking well into the daylight hours.